Put all the ingredients, except the milk, in a food processor and whizz until combined. Add the milk gradually and mix until you get a soft dropping consistency. I then divided the mixture in two and added pink food colouring to one half, before putting the mixture into tins and baking for about 25 minutes at gas mark 4. When the cakes were cooked and cooled I cut the pink layer in half and then sandwiched the plain layer between the two pink layers with pink vanilla buttercream. 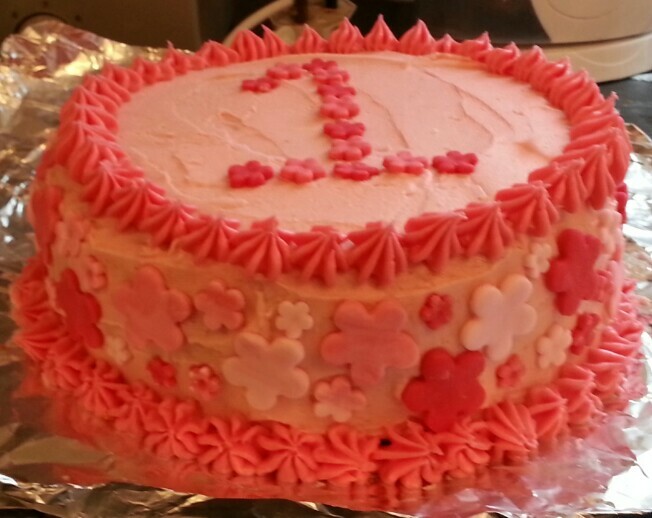 I covered the whole cake in more pink buttercream, and decorated it with pink fondant flowers in different sizes and shades. I have lived in Hackney for about four years, and saw a poster for Free Cakes at a children’s centre when I was taking my son (now 19 months) for a drop-in play session. I have always loved baking and loved the idea of being able to give a birthday cake to a child who might otherwise not get one. It seemed like a great opportunity to combine a passion with doing some good in the community, and also to have a chance to get a bit creative with decorations and themes – when else would I have had cause to make a Super Mario cake?! In the rest of my life, I work part time at a university, running training courses and events for researchers, and spend two days a week at home with my son. I’ve recently introduced him to baking, which he seems to love. Chocolate muffins have been a favourite so far!